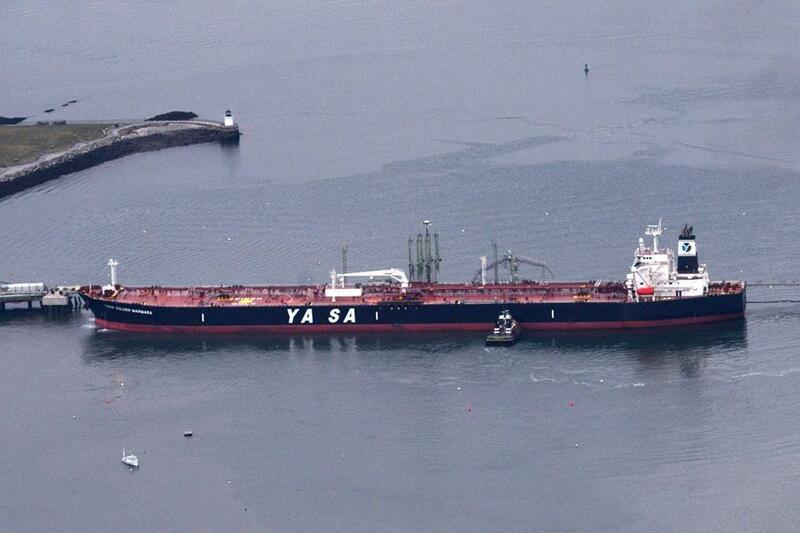 A tanker (above) prepared to offload crude oil recently in the deep-water port in South Portland, Maine. SOUTH PORTLAND, Maine — Over seven decades, the Portland pipeline has propelled some 5 billion gallons of crude oil across the mountains and beneath the pristine waters of northern New England to refineries in Quebec. Aside from a few small spills years ago, the 236-mile-long colossus of steel pipes and powerful pumping stations boasts a sterling record. In the upcountry towns through which it passes, the underground pipeline has drawn little ­notice since it was constructed in 1941. Environmentalists are bitterly fighting a plan to reverse the flow of the pipeline and send Canadian crude surging to offloading piers on Casco Bay. This would provide Canada — whose Alberta-centered oil industry is suffering from too much supply and too little access to overseas markets — its first direct pipeline to a year-round, deep-water port. The hullabaloo has pushed the low-key pipeline operator into a broader, angrier North American controversy over several proposed pipelines to transport oil extracted from western Canada’s tar sands. Perhaps best known is the battle over the Keystone XL Pipeline, which would stretch nearly 1,200 miles from Alberta across the American Heartland to the Gulf of Mexico. 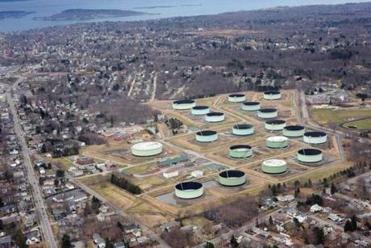 Portland Pipe Line Corp. has a tank farm (right) in South Portland. Its pipeline disappears underground here and stretches to Montreal. From an engineering vantage, the Portland project would be small potatoes. No big construction is envisioned. New pumps would be installed at company facilities in Montreal, a couple burn-off vents hoisted in South Portland. “All that would happen is that molecules would be flowing in a different direction within the same safe design criteria,’’ said Larry D. Wilson, president and chief executive of Portland Pipe Line Corp. But opponents see a ploy to make northern New England the first express conduit for what is viewed as the most polluting form of crude, opening the door to increased use and environmentally damaging production of the fuel. Detractors say carbon dioxide and other gases emitted during extraction and processing of Alberta’s ultra-heavy crude known as bitumen contribute to global warming. Moreover, they say, tar sands oil is inherently more toxic than other crudes — and spills would do greater harm. Crude oil comes in a variety of compositions. There’s light, heavy, sour, and sweet, referring to such variables as thickness and levels of sulfur. Then there’s bitumen crude, with a tacky texture like cold molasses. Bitumen saturates the sands spread beneath 50,000 square miles of forest and muskeg bog in northern Alberta. These oil sands comprise one of the richest lodes on earth, a prize that might transform Canada into a true energy superpower if only it could export more easily to Europe and Asia, as well as to the United States. In 2005, the country shot past the Persian Gulf region as America’s number one source of imported oil, with some 2.9 million barrels of crude and other petroleum products crossing the border daily, according to US figures. The 236-mile-long pipeline, which was built in 1941, has a good safety track record. Most of this is bitumen crude. The strip-mine-like removal of bitumen releases some 16 percent more greenhouse gases than the drilling of conventional crude, according to a recent study by the US State Department. “The Portland pipeline isn’t some obscure local issue — it’s a fuse leading straight to one of the most dangerous carbon bombs on the planet,’’ said Bill McKibben, a professor of environmental studies at Middlebury College in Vermont. The company, startled by the onslaught, bristles at attempts to cast it as a villainous would-be sower of environmental havoc. “We’re dedicated to safety, respectful of the environment, and have earned our reputation for being a good neighbor the hard way — by being one,’’ said Thomas A. Hardison, director of operations. The Portland pipeline was built just before the start of World War II as a desperate hedge against marauding German submarines. Canada joined the war against Hitler two years before the United States, and tankers carrying crude to Montreal made easy targets for U-boats at the approaches to the St. Lawrence River. The pipeline meant oil carriers no longer had to make the exposed passage to keep Quebec refineries chugging. The present 24-inch and 18-inch diameter pipes were laid in 1965, replacing the original equipment. Newer, state-of-the-art safety systems monitor operations from South Portland to East Montreal. The pipeline has a pumping capacity of 600,000 barrels a day. Its twin-berth pier on South Portland harbor can offload a tanker containing 1 million barrels of crude in 30 hours — and deliver that batch to Montreal in 2½ days. But the company has struggled in recent years as Canada’s appetite for imported oil diminished while domestic production boomed. Wilson, the pipeline president, declined to discuss specifics, but acknowledged that business has fallen significantly and that the company closed the 18-inch pipe and filled it with anticorrosive nitrogen, awaiting better days. Reversing the flow to tap Canada’s growing hunger for foreign oil markets could be the only way to save the company and the jobs of its 43 employees, some of whom have held good-paying jobs there for decades. The pipeline also has made Portland one of the busiest oil ports on the Eastern Seaboard; even today — despite Canada’s diminishing demand — some 70 tankers a year offload from the far corners of oildom. But what seemed, at first, a far-fetched crusade against the pipeline has gained surprising traction not only among ardent greens but also mainstream politicians and some ordinary citizens. 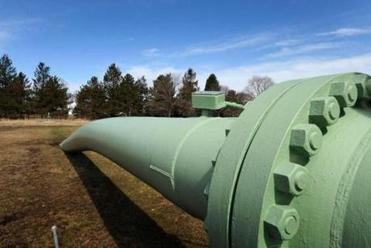 The issue has been inflamed by last month’s pipeline spill in Mayflower, Ark. — involving Alberta crude — and a much larger 2010 pipeline rupture that released more than 800,000 gallons of tar sands crude into Michigan’s Kalamazoo River. Eighteen members of Congress, including Massachusetts Senator Elizabeth Warren, have signed a stinging letter demanding stringent federal environmental review of the pipeline proposal. In recent months, protestors staged a sizeable antipipeline street demonstration in Portland, while 29 Vermont communities — none located on the pipeline’s track — passed Town Meeting resolutions banning “tar oil’’ from the state. Seventy-five percent of imported Canadian oil, much of it bitumen, already reaches the United States via an intricate web of pipelines. What Canada sorely lacks is a dedicated pipeline to carry huge volumes of crude fromlandlocked Alberta to ice-free ports, such as Portland. A plan to build a pipeline across the Canadian Rockies to British Columbia has stalled in the face of furious opposition. The Obama administration so far has blocked Keystone. There’s a vague proposal to construct an all-Canadian pipeline to New Brunswick on the Bay of Fundy, but that’s years away. That should leave Portland Pipe Line occupying the catbird’s seat. Correction: Because of a reporting error, an earlier version of this story gave an incorrect figure for the amount of oil imported daily into the US from Canada. The correct figure is 2.9 million barrels per day.